Prof. Shree Nayar's team has developed a novel sheet camera that can be wrapped around everyday objects to capture images that cannot be taken with conventional cameras. Nayar's team developed a novel sheet camera that can be wrapped around everyday objects to capture images that cannot be taken with conventional cameras. 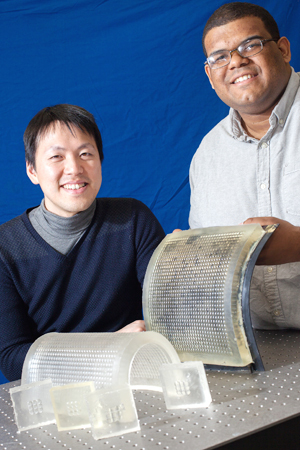 They designed and fabricated a flexible lens array that adapts its optical properties when the sheet camera is bent. The researchers arrived at their passively adaptive lens array by optimizing its geometry and material properties. They fabricated their prototype lens array using silicone and demonstrated its ability to produce high image quality over a wide range of deformations of the sheet camera. The research was conducted in Nayar’s Computer Vision Laboratory and was funded by the Office of Naval Research.